Fèis Ìle is about so much more than just the distillery days, even if your focus is solely on whisky. Islay plays host to all manner of tastings, masterclasses and charity events, as Tim Forbes discovers. It’s unusually hot on Islay. A risk of sunburn is not normally what one expects for the Fèis, but more than one of our party has already found themselves afflicted. Bacon-faced, we bask in the early morning sun. I’m standing on a boat in Port Ellen harbour, glass in hand, bobbing on the sparkling sea. This morning’s event is a collaboration between the Scotch Malt Whisky Society and The Whisky Lounge and, even for Islay, even for Fèis Ìle, it’s something special. It’s 10am on board Irene, a high-masted, century-old west country trading ketch. This beautiful sailboat traded through both World Wars, her cargo anything from building materials to manure. Irene has a colourful history: passing into private ownership in the 1960s, she sailed back and forth across the Atlantic between Europe and the Americas. In 2003, Irene’s 97th year, disaster struck when the boat caught fire at a Caribbean port, burned down to the waterline and sank. Undeterred by this catastrophe, Irene’s owners had the remainder of the hull and the surviving ironwork raised from the ocean floor and arranged for the carcass to be towed back across the Atlantic to Europe. Now back in fantastic condition after a loving, eye-wateringly expensive restoration, Irene carries high-end clients on voyages around the UK. And hosts the occasional whisky tasting. 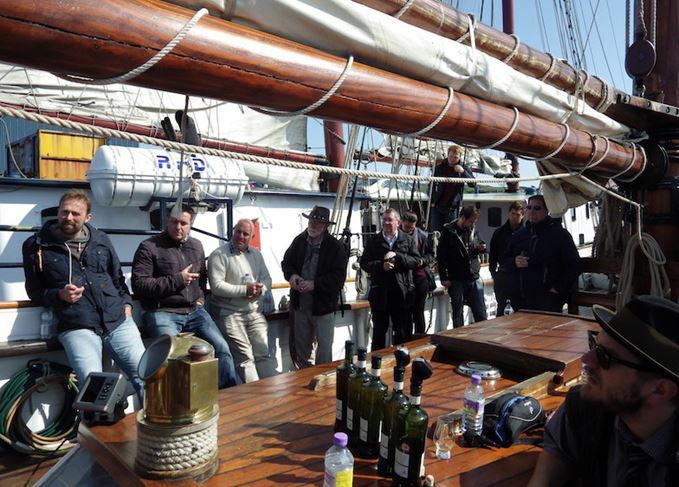 SMWS ambassador John McCheyne steps forth and delivers breakfast whisky to a group of 30 or so mixed European Fèisophiles. The first dram, a feisty young Bunnahabhain fittingly entitled The Gifts of the Sea, weighs in at 58.9%. This is not a time for compromises. Over the next hour-and-a-half, John introduces us to a surprisingly toothsome young Ledaig (42.21 A Ploughmans on the Beach, 59.4%), a delightful 15yo Bowmore (3.260 Delicate, Perfumed Sweetness, 55.3%) and a superb Ardmore 14yo (66.83 A Memory of Summer, 54.7%) before finishing with the dram one suspects sold many of today’s tickets: the Society’s Fèis Ìle bottling for this year, a humungous Port Charlotte (127.44 Cantina Mexicana 65.9%). This second fill Oloroso cask-matured monster is an assault on the senses at full strength, but thankfully swims beautifully and is already in danger of running out, having become one of the most sought-after bottlings of the festival despite a three-figure price tag. Later, still sunbaked at Laphroaig amid the staggering Scandewegians, I spy two of my most faithful regulars from my Brighton whisky tastings. The Fèis is like that: Islay at its most European, a surge of whisky tourists pouring a vast torrent of cash into the local coffers, yet still a meeting-place of friends, like-minded souls coming together, celebrating whisky. The island’s small size makes such seemingly chance encounters almost inevitable. The magic of the island’s reach extends even unto the mainland – why, even in Glasgow Airport while waiting for my flight over, had I not bumped into St Broom of Hoveshire, here to deliver a joyous sermon at Lagavulin’s bicentennial celebrations? We dander along the newly-constructed Three Distilleries Path between Lagavulin and Laphroaig, and thence to Port Ellen. This path has been delivered by Sustrans, a charity promoting active travel (walking, cycling) with money from Argyll & Bute Council and the distilleries. It’s a great thing, keeping tipsy tourists away from the road and thereby making the process of navigating between the south coast distilleries safer for both motorists and pedestrians. My afore-mentioned regulars, Mr and Mrs Snoops, are two true whisky souls. Over a pint in the Islay Hotel I ask how long they’re staying. A full 12 days, it transpires. I admire their tenacity. ‘But this is it for us for the year. It’s our only holiday. We do this every year.’ I salute their commitment. We take in a charity whisky tasting at The Ballygrant Inn, home to an award-winning whisky bar. I’m introduced to a friendly Taiwanese cask broker, who is kind enough to let me try a Karuizawa 1980 he happens to have in his bag. It smells very strongly of smoked meat. ‘I don’t like this one,’ he tells me, after I’ve sipped it and tried to be polite. Over a three-course meal including excellent home-made onion bhajis and a rich, hearty, slow-cooked Islay venison casserole, host Tam Gardiner from Scotch Whisky Auctions introduces a range of wood-driven cask strength drams, ranging from a handfilled Aberlour straight from the distillery to the 167ppm Octomore 6.1. The event is in aid of two very deserving small independent children’s charities, Blameless, which provides recreational events for children and families affected by alcoholism and drug addiction; and Calum’s Cabin, a holiday retreat for children with cancer. The tasting raised around £1,000 for these charities. Another evening we saunter down across the road from Finlaggan House towards the glinting waters of Finlaggan Castle. The former seat of the Lord of the Isles is tonight the venue for a tasting organised by The Whisky Lounge and Diageo. Industry legend Colin Dunn is master of ceremonies, and has brought five Caol Ilas including the 12yo, Distiller’s Edition and this year’s Fèis bottling, a vatting of refill American oak hogsheads and ex-bodega Sherry butts. This latter is the dram of the night, but the star of the show is Donald Bell, chairman of the Finlaggan Trust, a quiet, elderly gentleman who seems to be able to see into history. He speaks slowly and softly, giving his spellbound audience tantalising glimpses into Islay’s feudal past. I’m not the only member of the party who could have listened to him all night. Dunn, as always, has the group in the palm of his hand, cracking his variable-quality jokes (even the bad ones become funny in the telling). His bonhomie is infectious. With a great host, great weather, a baffling lack of midges and an awe-inspiring setting, everyone’s eyes are shining. More than one punter tells me they will never forget this evening. We wander around the ruins through the daisies and dandelions in the last of the evening’s light, staring out over Finlaggan’s glassy waters. The wind is getting stronger now. Our glasses are singing.